Nurse practitioner Katherine Burchell remembers the couple that came in to the South of Market Health Center (SMHC) with multiple physical ailments, but who also, it was clear to her, suffered from behavioral disorders as well. They would talk nonstop, over and around each other. “It was chaos,” she says, but Burchell listened to every word, addressed every complaint. As the year went by, the sessions grew calmer. When the pair announced that they were moving away and would no longer be her patients, tears flowed on both sides. All aspects of the South of Market Health Center, from its large open windows to the inviting lobby, create a calming, safe and secure environment that put patients at ease and help staff gain their trust. These and other touches create a safe, secure, and calming environment, like that at any good private practice facility. Indeed, this sense of normalcy is what engenders the pride that many of the homeless and low-income patients express when talking about South of Market. Nurse practitioner Judy Anderson, a former Veterans Administration nurse, credits the thinking behind the new building—opened in 2011 after Capital Impact Partners provided critical financing that made the 20,000-square-foot-structure possible—as an important part of the healing process. When Anderson first started at the health center, it was housed in a decrepit warehouse that had been damaged in the 1989 Loma Prieta earthquake. The entry to that original facility was off an unwelcoming garbage-strewn, alley. The inside lighting was poor and the equipment ancient. Now, the ambience in the new facility goes a long way toward building trust with patients whose lives are already complicated by substance abuse, and who, she says, desperately need to take the hard step of testing for HIV or hepatitis C.
David Reynoso, Judy Anderson and Katherine Burchell are among the dedicated team at South of Market Health Center. Anderson, a former Veterans Administration nurse, is thrilled with the level of care she is empowered to provide patients. “I’m making a difference, not just making money,” she says. Patients attest to the critical role that SMHC plays in filling a void for many who would otherwise fall through the cracks of the mainstream healthcare system. The surrounding neighborhoods, including Tenderloin and Potrero Hill, are home to some of the most economically disadvantaged residents of the city. The unemployment rate in South of Market is more than double the citywide rate, with 23 percent of the population living below the poverty level, compared to 15 percent for greater San Francisco. A majority of patients who walk through the front door are homeless, uninsured, and struggling with chronic diseases or addiction and behavioral disorders. Their healthcare is best served by the short-term focused intervention model at which SMHC excels. 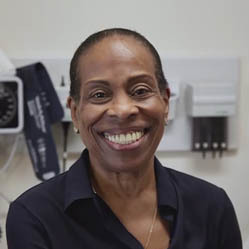 Homeless and without medical insurance, Susan Gouveia – who was once a registered nurse – turned to the South of Market Health Center. That care helped bring stability to her life and she now serves as a patient representative on the Center’s Board of Directors – “I think this clinic saved my life in a lot of ways,” says Gouveia. 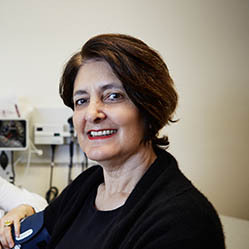 “I think this clinic saved my life in a lot of ways,” says Susan Gouveia. Two years ago Gouveia, who worked as a registered nurse, was drinking so heavily that she lost her home and job. She moved into a treatment center at the Salvation Army. But she was without medical insurance. “If the health center hadn’t been here to provide care I would have taken on a full-time job just for the insurance and would still be drinking,” says Gouveia, who now serves on the center’s board of directors (half the board members come from the patient community). She also remembers her nervousness at using a community center for the first time, even though patients at the Salvation Army were giving SMHC rave reviews. “I was blown away by how nice it is,” she says. Overweight and addicted to drugs, Beverly’s family had abandoned her. With the help of the team at South of Market Health Center, she got her life back on track and even became a patient representative on the Board of Directors. Listen to Beverly in her own words here. Susan Gouveia was both homeless and an alcoholic when when came to South of Market. Click here to hear Susan describe how their team transformed her life.